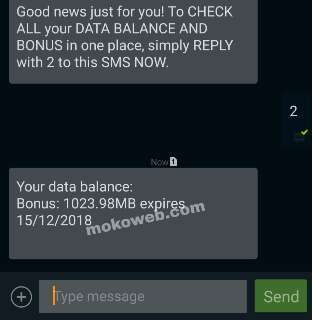 MTN Season of Surprise is a free data promo given to all MTN customers every Christmas period (end of the year) to thank them for staying on the network. This year MTN gave me free 1025mb (equivalent of 1gb) as “season of surprise package” but I noticed some customers got just 500mb. Be it as it may, it’s still something to be glad for this festive season. The MTN season of surprise offer is also aimed at keeping customers connected online with friends, colleagues and family this period without paying more for data. Recall that 1GB data from MTN costs N750 on a normal day so in other words, you are getting free 750 Naira this Xmas from MTN network. Normally, MTN sends SMS notifications for eligible and lucky customers every December but you can still dial *142# on your MTN line to see your surprise package. Dear Customer, you don’t have any active data bundle. Please dial *131*1# to buy another data bundle. Yours can be different from mine. Yours can be data + call credit, call credit only or data only. Enjoy the offer and have a blissful Christmas and new year celebration.